Objective of the study: Evaluate the real time thermal footprint of a continuous power delivery technique with bipolar sealing technology as measured by high-definition thermography. Description of the methods: Thermography is the use of an infrared imaging camera to record the radiating heat in real time, as thermal energy is emitted from an object. 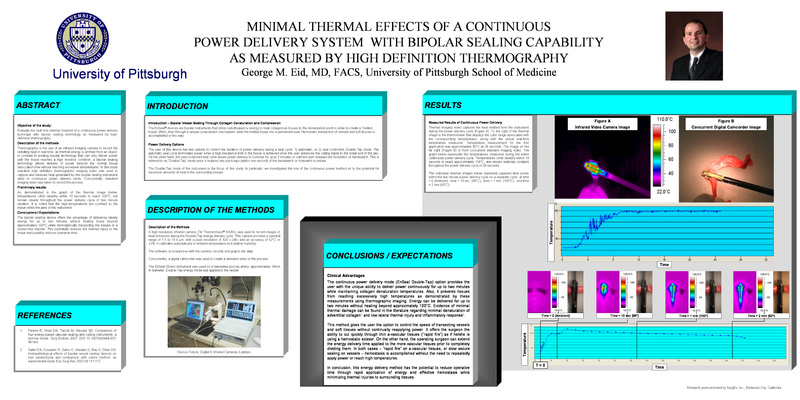 In contrast to existing bipolar technology that can only deliver power until the tissue reaches a high resistive condition, a bipolar sealing technology allows delivery of power beyond the normal tissue desiccation time without reaching excessive temperatures. In this study real-time high definition thermographic imaging video was used to capture and measure heat generated by this bipolar sealing instrument while in continuous power delivery mode. Concurrently, standard imaging video was taken to record the process. Preliminary results: As demonstrated in the graph of the thermal image below, temperatures climb steadily within 10 seconds to reach 100° C, but remain steady throughout the power delivery cycle of two minute duration. It is noted that the high-temperatures are confined to the tissue within the jaws of the instrument. Conclusions/Expectations: The bipolar sealing device offers the advantage of delivering steady energy up to two minutes without heating tissue beyond approximately 100° C while hemostatically transecting the tissues in a scissor-like manner. This potentially reduces the thermal injury to the tissue and possibly reduces operative time.